Apiary hygiene has become increasingly recognised for its importance in the past few decades. Old notions of keeping back ancient comb in the hope of saving a few pennies are now regarded as false economy. There is little doubt that there is a need to focus on apiary hygiene in Somerset. Many diseases can spread by beekeepers’ actions, but perhaps the most important are those that are not readily visible. EFB often exists in a sub-clinical state and Somerset has a persistent problem with EFB. Despite long-term national reduction in EFB prevalence, Somerset had 52 cases recorded in 2017. Nosema is another endemic problem linked to colony losses with the prevalence of Nosema apis and N. ceranae both around 40% of apiaries in the South West. Without an approved treatment, the only management option for Nosema is good hygiene practices. The beekeeper can spread disease both within and between apiaries. Gloves are likely to be the most important item of clothing to spread disease. Washable gloves are preferred and Marigold-type household gloves serve the purpose well and allow scrubbing in a washing soda solution after hive inspections. For visiting the apiaries of others or when disease is suspected, disposable gloves such as ‘nitrile’ inspection gloves are preferred. A separate bee suit for visiting the apiaries of others is also good practice and this should be washed between apiary visits. Bees themselves can carry disease and beekeepers should be mindful of this when performing beekeeping operations. For instance, when amalgamating two colonies, the beekeeper should be confident that they are not weak due to disease. 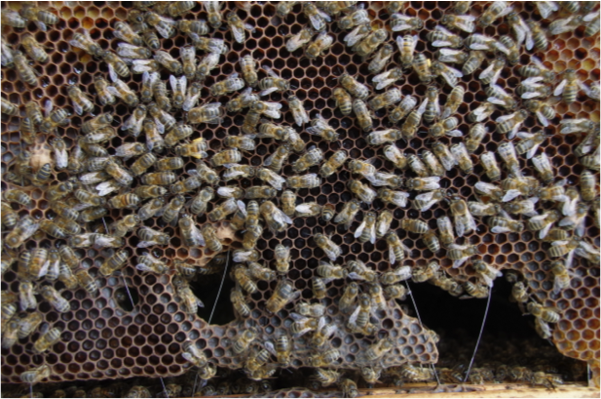 The same thought process needs to be engaged when balancing colonies and even if some inter-colony transfer of bees within an apiary will be required from time to time, transferring bees, brood or comb between apiaries should be minimised. Drifting can also spread disease and well-spaced hives, with differing orientation or colours and shelter from winds can reduce this. Robbing can also spread disease and this can be a particular problem as any diseased colonies are likely to be the victims of robbing, whereas healthy colonies are more likely to be strong and in a position to rob. Keeping bee-tight colonies, minimising inspection times, minimising entrance spaces, feeding only in the evening, avoiding dropping comb or syrup in the apiary and reducing entrances towards the end of a nectar flow will reduce robbing. Sugar syrup is the healthiest feed, but if honey must be fed, it should be fed back to the hive from which it was taken. There is importance in early and adequate autumn feeding to reduce water content, fermentation of stores and dysentery, which in turn may promote spread of Nosema. The bees are important as well with strong and genetically diverse colonies better able to repel disease. There has been much interest in hygienic traits, and while there is some uncertainty about their precise nature, it obvious that some strains harbour more disease than others and this is observed in quantities of chalkbrood and wax moth in the hive, but also the amount of debris on the flood when using solid-floor hives. It is also worth mentioningthat improving the genetics of bees by buying in new queens or colonies carries a risk of spreading disease and so there are inherent benefits to locally sourcing breeding material where appropriate. Swarms can also be a source of disease, especially where their origin is not known. The gold standard is to have a second ‘bolt hole’ or quarantine apiary. Ideally new swarms should be hived onto foundation and not fed for two days to maximise their metabolism of nectar that they carry in their honey crops, thereby reducing any disease that they carry with them. A thorough disease inspection around a month later when brood is present is also a good idea. acid fumigation requires some care. Regular comb replacement is most practical for most beekeepers with both the Shook Swarm and Bailey comb changes being effective methods to transfer the combs in one go and minimise disease being spread to the new comb. With a persistent problem with EFB and Nosema in Somerset, hygiene in the apiary is likely to become increasingly important. We are likely to need to consider this more with the hives, combs, bees and tools that we use and the clothes that we wear. We also need to be mindful of this when we are working in the apiary.